Actually for me, this is the perfect way to start the new year, channeling my inner 10 year-old, growing up in New Delhi, walking back from the school bus stop, only to be interrupted by the most beautiful sound of all—a ringing bell, mounted atop a rickshaw cart, stocked with a metal ice box, holding delicious Kulfis—the ubiquitous north-Indian home-made ice cream, enjoyed by anyone and everyone. Kulfi is a perfect mid-day/evening snack, which is also affordable, universal and extremely popular liked by most people, best enjoyed on a hot day. 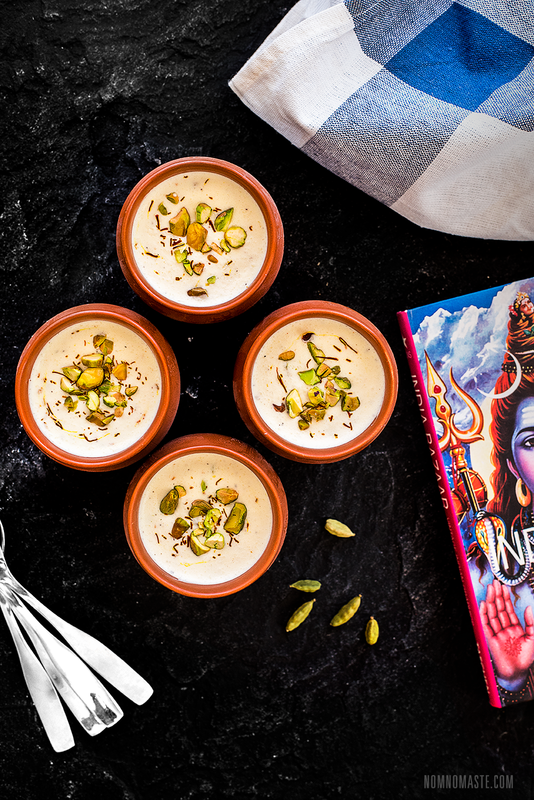 Although Kulif's popularity peaks in the north, it is available all over India, and is truly India's home-made ice cream. Its popularity also spans the subcontinent, popular almost all over Pakistan and Afghanistan, with variations available in Iran a as well. I remember enjoying a chilled Kulfi on my short walk home from the school bus stop, handing the man two 1 Rupee coins, in return for a skinny, tall and slender Kulfi on a bamboo stick. 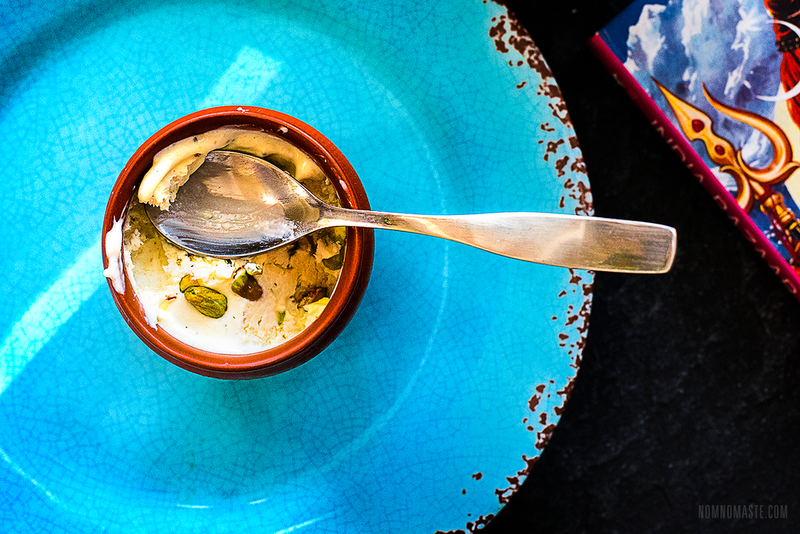 It was rich, creamy, sweet and so refreshing, with bits of Pistachio making an appearance every other bite, while the scent of Cardamom flavored the air around me. The one I made today, tastes just the same but in a Matki an earthen clay pot, which is how it's sold at most brick and mortal establishments, all over Delhi, for various reasons that I can only speculate about. Perhaps it's the presentation or maybe it affects the taste, to me it's just a better experience—a more rustic one. If you find yourself in Delhi, don't miss out on enjoying a refreshing Kulfi, and if I were to recommend where to get one, it would be undoubtedly at Roshan Di Kulfi it'll be worth the wait I promise. Here on the east coast, it was a chilly day with light snow falling all afternoon. It was a pretty scene, idyllic and serene. I popped open the freezer door, and pulled out a frosted Matki of Kulfi topped with pistachios and saffron, scented with rose and cardamom. Before I took a bite, I held it close to my nose to get a whiff of the summer in 1987, when for this 10-year old boy, time stood still for just a few precious moments, childhood memories revived all over again. 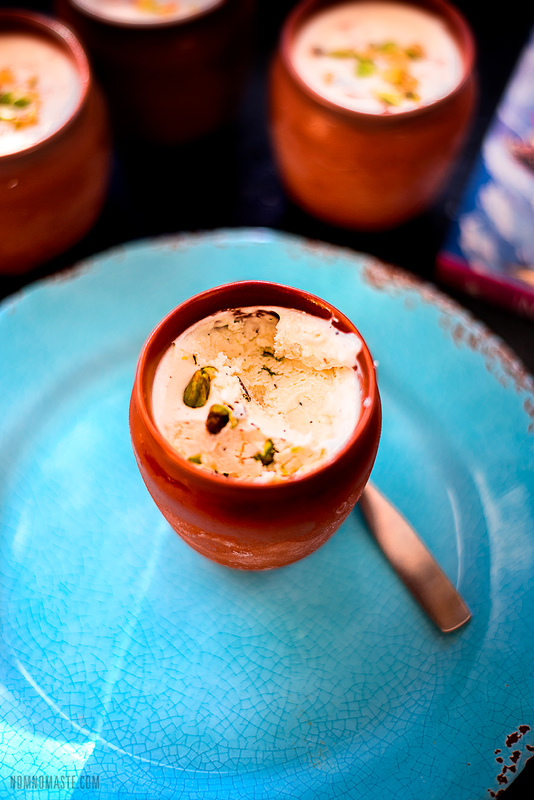 My version of the Kulfi gets done with five basic Kulfi ingredients plus optional toppings and flavorings, and minimal prep time. The majority of the time is spent it sitting in the freezer, and it really tests you resolve to not dig in prematurely. I experimented with other variations, and also leaned heavily on a recipe I made earlier—The Rose Cardamom Canolis done in partnership with Bob's Red Mill. Short of the long: If you tried the Canoli recipe above, you can crack the code on this Kulfi no problem. It uses whipped cream as an additional element. Neel looking at cool Indian graphic art peculiar to the 80s era. I love that this blog allows me to relive my own childhood and walk Neel down memory lane with his dad as a kid growing up in a completely different part of our world. I want to make sure he, Noor and Krish look back at their childhood fondly, hopefully whenever they think of dad—he'd be in the kitchen—whistling, cooking away something he'll critique for hours later. Special stuff you see! Let' look at the recipe then, but a few tips/pointer before we get to that. 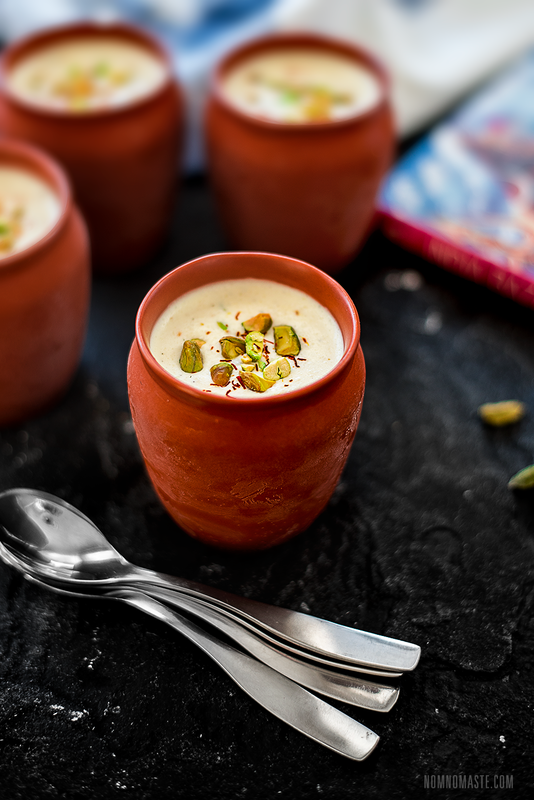 Kulfi comes in many flavors and variations, with Cardamom Pistachio being the most popular one, but you can easily skip the nuts and the cardamom if you're allergic or don't like them. Cardamom on the other hand I would recommend, but there are Kulfis that don't even have that spice, so you're free to skip it, but I'd highly recommend trying to get your hands on it. Start by placing a large mixing bowl you'll be using to make this recipe in the freezer for 15 to 20 minutes. Pour 1 cup (very) chilled heavy cream, into your chilled mixing bowl along with 1/4 cup sugar and whip the mixture with your stand or hand mixer. The goal is to incorporate all of the sugar well and achieve stiff peaks. Once you have stiff peaks, stop. Do not overchurn. Add in 1 cup condensed milk and the Cardamom powder, 2-4 drops Rose flavoring, as well as the strands of Saffron if using, and gently incorporate with a spatula, till well mixed. Incorporate well one last time to ensure even distribution of ingredients. Place in the freezer for at least 4 hours, but preferably overnight.